Nerys Ann Johnson was born on 1 October 1942, in Colwyn Bay, North Wales. Her family later moved to Mansfield, Nottinghamshire, where she grew up. For several years she was treated in hospital for childhood arthritis, and, by her own account, it was the colouring books brought to her there that initially sparked off her interest in painting. In 1961, she went to study Fine Art (Painting and Art History) at King’s College, University of Durham, and made her home in the North East. After graduating, she taught Art for two years and, in 1967, was appointed Keeper of Fine Art at the Laing Art Gallery, Newcastle. In 1970, aged 28, she became Keeper-in-Charge of the Durham Light Infantry (DLI) Museum and Art Gallery, Durham, and went on to establish a national reputation as an innovative curator with wide-ranging interests. As far as time allowed, given her demanding role, she would draw and paint. Initially, her focus was mainly on abstracts and landscapes, and as late as the mid-1990s, she was working on landscapes and townscapes, notably during two trips to Venice. However, over the years she had become increasingly absorbed in drawing and painting flower and plant forms. In 1989, due to deteriorating health, she took early retirement, and was then able to devote herself fully to her artwork. Her output was prodigious, and her works were displayed in numerous exhibitions, either as sole artist or contributor. Increasingly confined to her flat, the inspiration she drew from flowers and foliage intensified. Flowers from her garden, or brought by her many friends, enabled her to get in close to her subject matter, exploring colour and structure in near-abstract compositions. She was also interested in flowers as they budded, bloomed and faded, her awareness of the tradition of painting flowers as emblems of mortality running parallel to her concern with movement, structure, line and contrast. 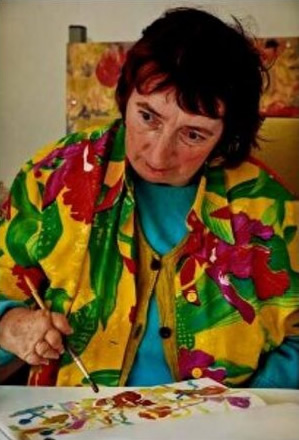 With the help of a devoted body of assistants, Nerys was able to continue painting – with colour increasing in intensity as the scale became smaller – until a few days before she was admitted to hospital, where, following an operation, she died on 12 June, 2001. Philip King and Nerys A Johnson, ‘Henry Moore: Head-Helmet’, catalogue of 81 works with essays by Philip King (Henry Moore: The Working Day) and Nerys Johnson (Heads and Helmets), to accompany exhibition at DLI Museum & Art Centre, in conjunction with University of Durham, 1982. Nerys Johnson, ‘Moments of Being’, catalogue compiled for an Arts Council touring exhibition devised by Nerys Johnson, with sketches and notes by her, 1988. Nerys Johnson, ‘A Fresh Look’, a catalogue compiled for a touring exhibition of 20th century drawings and paintings by British artists, devised and selected by Nerys Johnson from the collection of Middlesbrough Art Gallery, 1992. Julian Spalding, ‘Nerys Johnson: Artist whose work defeated her disability’, obituary in The Guardian, 4 July 2001. David Buckman, ‘Nerys Johnson’, obituary in The Independent, 30 August 2001.